The global market for agricultural disinfectants has been expanding at a steady pace across most regions, driven primarily by the rising demand for meat products in India and China. The rapid growth of the agricultural disinfectant market is also attributed to the increase in research and development activities in order to improve the quality as well as efficacy of disinfectants. There has been a growing emphasis on minimizing operating expenditure, improving performance, ensure crop protection, and adhering to regulatory standards. The development of greenhouse vegetable production and vertical farming are also considered to be key drivers in the global agricultural disinfectants market. The market is expected to grow from a value of US$1.7 bn in 2015 to US$2.5 bn by 2024, at a CAGR of 4.4% therein. By form, the agricultural disinfectant market has been divided into liquid, powder, and others, such as gels and granules. The liquid agricultural disinfectants segment captured the leading share in 2015 due to their easy availability, low cost, and soluble nature. Liquid agricultural disinfectants are used in agricultural farms to ensure better crop productivity and in the drinking water of the livestock. Based on application, agricultural disinfectants are used on land, in the water, and in the air. The application of these disinfectants is most common on land, followed by the water sanitizing and aerial segments. On the basis of end use, agricultural disinfectants are used in agricultural and livestock farms. Livestock farms surpass agricultural farms in terms of demand owing to the rising demand for meat products and the need to ensure the safety of the livestock. Farmers are especially concerned about newborn livestock as they are increasingly vulnerable to diseases. By geography, the agricultural disinfectant market is segmented into North America, Europe, Asia Pacific, Latin America, and the Middle East and Africa. North America dominated the market in 2015, accounting for more than 33.0% of the global agricultural disinfectant market that year. The region has been displaying strong growth owing to the increase in livestock and a rising demand for quality meat products, which in turn, results in the growing demand for agricultural disinfectants in livestock farms. The agricultural disinfectant market in Europe held the second largest share in 2015 and is expected to grow consistently during the forecast period. France boasts of a large number of agricultural fields and hence captures the dominant share in the region. The growing focus in Germany about the importance of crop and livestock protection is likely to boost the agricultural disinfectant market in the country. Asia Pacific is expected to witness impressive growth during the forecast period, attributed mainly to the rising opportunities presented by developing countries. Continuous research and development and the increasing demand for meat products in countries such as India and China is expected to boost the market for agricultural disinfectants by 2024. The vendor landscape of the market is immensely consolidated owing to the presence of several domestic and international manufacturers. This makes the market rather competitive. The leading players in the agricultural disinfectant market include Zoetis (U.S.), The Chemours Company (U.S.), Nufarm (Melbourne), The Dow Chemical Company (U.S.), The Stepan Company (U.S.), The Thymox Technology (Canada), Neogen Corporation (U.S.), Fink Tec GmbH (Germany), QuatChem Limited (U.K.), and Entaco N.V. (Belgium). Agricultural Disinfectants are the most important component that primarily are used for crop and livestock protection. These agricultural disinfectants are categorized into different forms and the most important forms are liquid forms, powder forms, and granule and gel forms among others. These are applied on land, water sanitizing and aerial. By end use the market has been bifurcated into agricultural farms and livestock farms. Proper disinfection is required to protect crops and livestock from harmful diseases or sterilize the microorganisms. 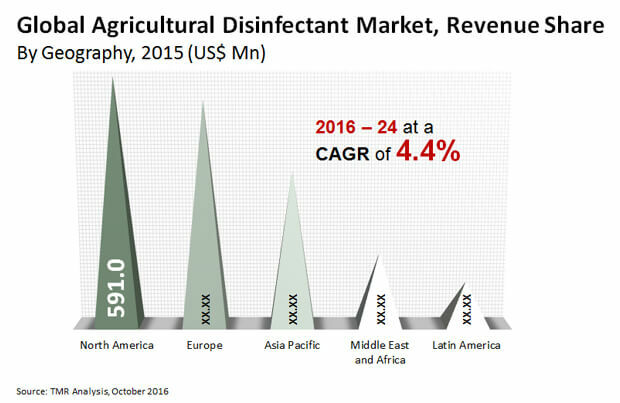 The market for agricultural disinfectant is growing at a magnifying pace across all geographical regions worldwide. Globally, the market is expanding at a magnifying rate, majorly driven by demand for meat products from the China and India. The market for agricultural disinfectant in all these regions is expected to show significant results owing to increasing research and development for enhancement of disinfectants in the region. Moreover, emphasis on improving performance, reducing operating expenditures, maintaining regulatory standards, increasing the demand to ensure crop protection are impacting the market for global agricultural disinfectant globally. Development of vertical farming and green house vegetable production coupled with rising number of diseases among livestock population are major drivers of the agricultural disinfectant market globally. Although rising demand for meat products from the emerging countries like India and China under the Asia Pacific region is majorly accounted for the steady growth in agricultural disinfectant. In addition proper health of livestock is gaining importance across the globe due to the rising demand for meat products. It is imperative to protect the livestock population through proper application of disinfectants in drinking water, yards, surface, among others to protect them from harmful diseases. Routine cleanliness, frequent removal of manure and using proper disinfectants provides better results in terms of health for the livestock population. Owing to this factor, the impact of this driver is high and is expected to remain high during the forecast period. Moreover, increasing demand for quality meat products coupled with changing lifestyle patterns of the population is boosting the use of disinfectants on the new born vulnerable livestock population so that they do not catch diseases. Health of the human population is dependent on the health of the livestock population; therefore, it is crucial to protect these animals. Increasing development of vertical farming methods coupled with increasing greenhouse vegetable production techniques has led to a boom in the global agricultural disinfectant market. This has led to increased application of disinfectants in crops for better production and to ensure food security. However the recent downturn in the agricultural disinfectant products market is due to the harmful effects of these products that has impacted the growth of the disinfectant market negatively. Disinfectant manufacturing companies are currently refraining from new projects due to the harmful arising due to the lack of knowledge among the farmers regarding the proper usage methods of the disinfectants. Research and development laboratories offer huge growth potential for the agricultural disinfectant market. There has been an increase in research projects pertaining to the use of environment friendly agricultural disinfectants in developing countries. Therefore, considering the benefits associated with the use of agricultural disinfectants in developing countries, it is expected to act as a prime future opportunity for the market. Geographically, Asia Pacific agricultural disinfectant market is experiencing the fastest growth from 2016 to 2024 in global agricultural disinfectant market. In order grab a better picture of the agricultural disinfectant market, a key trends analysis has been done. The leading players in the market include Zoetis (Florham Park, New Jersey United States), The Chemours Company (Wilmington, Delaware, United States), Nufarm (Melbourne), The Dow Chemical company (Midland, Michigan, United States), The Stepan Company, (Northfield, Illinois, U.S.), The Thymox Technology (Quebec, Canada),Neogen corporation (Lansing, Michigan, U.S.), Fink Tec GmbH (Oberster Kamp Germany), QuatChem Limited. (United Kingdom) and Entaco NV. (Belgium) among others.